What's the Importance of the Gaspee Affair? Most people know quite well the story of the burning of the Gaspee. But have you ever wondered why we know it as the "Gaspee Affair" rather than simply the "Burning of the Gaspee?" It’s because that spark that started the American Revolution had little to do with the actual lighting of that British ship on fire. Rather, it was the overzealous British reaction to this incident which stirred the furor of American patriotism — in a much broader and more important way. The British had sent HMS Gaspee into Narragansett Bay to enforce maritime trade laws. Rhode Island citizens had long avoided such regulation by simply smuggling their shipped goods into and out of our local ports. 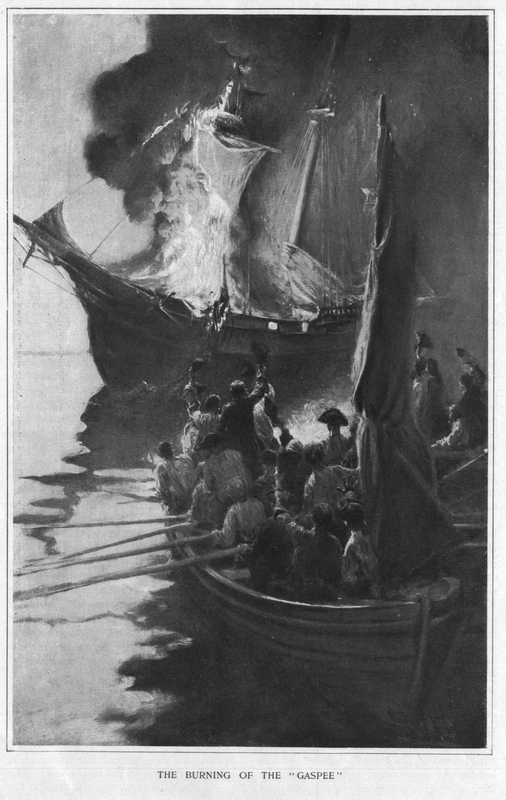 To rid the waters of this new nuisance, prominent local citizens lured the Gaspee aground in June of 1772, shot and wounded its commanding officer, captured the crew, and burned the schooner to its waterline. King George III and his ministers were furious at this threat to their colonial powers. In addition to offering a huge reward to those that would turn in any of the raiders, the British appointed a commission of inquiry to further investigate the matter. But to the credit of Rhode Islanders, no one seemed to know anything when called to testify. The overreaction by the British was that this Royally-appointed commission of inquiry was set up as kangaroo court, specifically empowered to send suspects directly to England for trial. This concept was a novel threat to the basic liberties to which colonists had long grown accustomed. The Americans considered themselves to have had the same rights as all other Englishmen that had evolved from ancient Anglo-Saxon law and the Magna Carta. Among such protections was the right to a trial by a jury of one’s peers, and the right to a local trial. The action of sending suspects out of the local area directly to England for trial would make any defense nearly impossible. Any such persons charged with crimes would find it very hard indeed to have witnesses present to help prove their innocence. Local trials also ensured a local jury that would be familiar with local customs and reputations. Colonial courts, long accustomed to judicial independence, tended to side with the defendant in many actions brought by the Crown against colonists, but British courts would not be so kind. Insultingly, this British commission of inquiry bypassed the existing American court system entirely. Nothing of particular excitement occurring for a considerable time; our countrymen seemed to fall into a state of insensibility to our situation. The duty on tea had not yet been repealed, and the Declaratory Act of a right in the British parliament to bind us by their laws in all cases whatsoever, still suspended over us. But a court of inquiry held in Rhode Island in 1772, with a power to send persons to England to be tried for offences committed here was considered at our session of the spring of 1773 as demanding attention. …. We were all sensible that the most urgent of all measures was that of coming to an understanding with all the other colonies to consider the British claims as a common cause to all, and to produce a unity of action, and for this purpose that a committee of correspondence in each colony would be the best instrument for intercommunication, and that their first measure would probably be to propose a meeting of deputies from every colony at some central place, who should be charged with the direction of the measures which should be taken by all. We therefore drew up the resolutions …. The Gaspee Affair also played a very large role in the media coverage that drove the spirit for independence in the years just prior to the Revolution. Newspaper accounts of the attack on the Gaspee and the subsequent commission of inquiry were front page news not only within the colonies themselves, but across the Atlantic in Britain. The Gaspee Affair was also the subject of a very influential pamphlet, An Oration on the Beauties of Liberty, written by Rev. John Allen of Boston. This pamphlet was often quoted by John Adams, James Otis, and other Revolutionary leaders, and was among the most published pamphlets during the pre-Revolutionary years. When the time came to cut ties with the Mother Country, the American leadership assembled in Philadelphia in July of 1776 drew up a list of grievances against King George III. Included in the Declaration of Independence were some grievances that were directly attributable to the Gaspee Affair2: "He has combined, with others, to subject us to a jurisdiction foreign to our Constitution, and unacknowledged by out laws; giving his assent to their acts of pretended legislation. .... For depriving us, in may cases, of the benefit of trial by jury; For transporting us beyond the seas to be tried for pretended offenses:"
One can forever argue the point of which Colonial fracas against the British was the earliest. But as to the first shot, it depends on when you define the 'start' of the Revolution. We're not talking here of formal armed Revolution—we will happily cede that to Lexington and Concord. We're talking instead about the idealogical revolution for independence from Great Britain. For as John Adams said, "The Revolution was effected before the War commenced. The Revolution was in the minds and hearts of the people." In summary, the Gaspee Affair led directly to the unification movement of all the colonies, which, when formally united, became the United States of America. So, yes, in the larger scope of things, it was indeed America's 'First Blow for Freedom'.